It’s snowdrop time. But snowdrops are the most frustratingly difficult flowers to photograph. 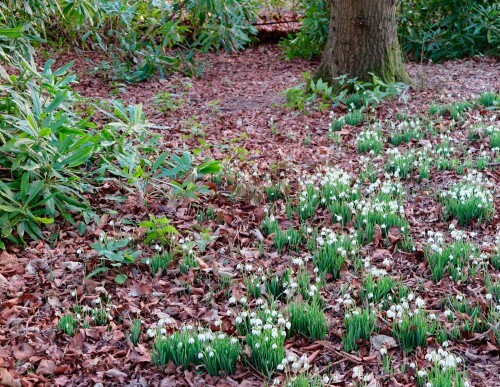 From this weekend onwards, there will be ‘snowdrop walks’ all round Britain. The NGS has a list of private gardens open for snowdrop days. You may want to share the innocent gorgeousness of snowdrops on social media or your blog. So I have asked garden photographer Lisa Valder for her top snowdrop photo tips.We went to Doddington Place Gardens (Kent), which has its snowdrop day on Sunday February 18th 2018. The main problem is that snowdrops are very white. But they emerge in the dullest time of year, in shady woods, surrounded by dried leaves or tree trunks. All of which are either quite or very dark. Lisa explained that a camera (or camera-phone) has to work out what the average light level should be. Then it adjusts itself accordingly. If there’s hardly any mid-range, then it will take either the very light bit or the very dark bit as ‘average’. The rest of the photo will be over or under-exposed. I photographed these snowdrops with the light behind them which helped stop the over-exposed washing-powder white. Surrounded by all that gloom, the white snowdrop petals often comes out over-exposed, with a blurry washing-powder glare. It was a huge relief to find out that I wasn’t imagining it – snowdrops genuinely are harder to photograph than many flowers. St Agnes Eve scarf designer Jacqui Sinnatt creates scarves from her photographs of flowers. She got this effect with snowdrops by shooting directly into the sun. You can see the delicate detail of snowdrop petals if you photograph them against a pale background. If you’re photographing snowdrops in the home – in a vase, for example – then you’ll get a better picture if you use a pale background. If you’re out in the woods, look at where the light is falling, and experiment. Not my best view, but I was determined to get a good shot of those snowdrops – be careful that you’re not standing or lying on other snowdrops! Lisa’s first tip is to go in closer and to photograph low down. Snowdrops (and many other flowers) look boring when taken from above. 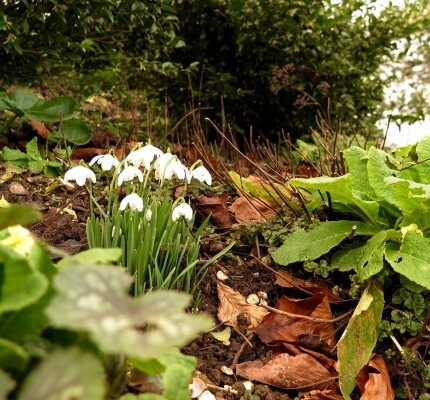 Sometimes going in closer helps the light problem – green is a mid-range colour, and your snowdrops will be less bleached out if they’re wholly surrounded by green rather than dark earth, brown leaves or tree trunks. 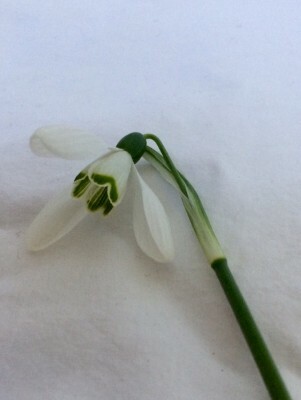 This snowdrop in my own garden was surrounded by green. So the white has come out better than it would have done against dark, bare earth. 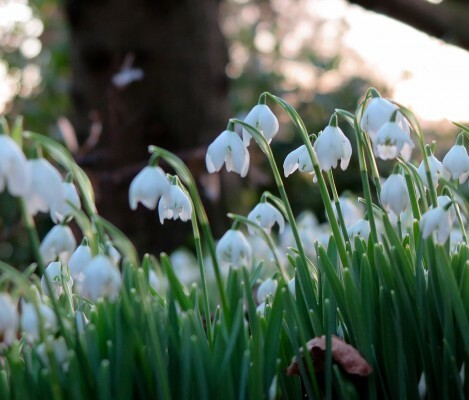 Snowdrops are tiny, but they are surrounded by big things – landscapes, evergreen shrubs, trees…a swathe of snowdrops often emerges as a picture of a tree with dandruff. Unless you are an expert photographer, which I’m not. Doddington Place Gardens has a wonderful avenue of giant redwoods under-planted with snowdrops but I have never managed to take a decent photograph of them. (You’ll have to go along on Sunday 18th to see them for yourself). ‘Go in closer’ is a top photography tip. However, if you’re trying to get the wider landscape in, you’ll lose it – one reason why swathes of snowdrops under trees are so hard to photograph. 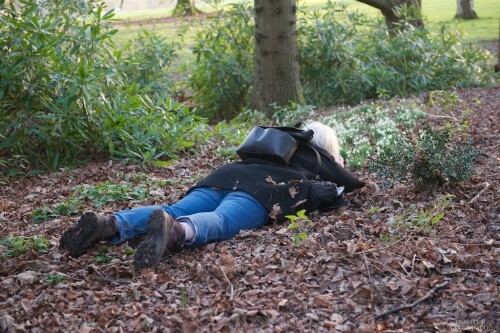 Going down low helps with proportion, too – but if the snowdrops are your target, you have to accept that you won’t be seeing much tree. But think about composition, warns Lisa. While I was taking the picture below, she reminded me about the ‘rule of thirds’. Don’t think about having your subject bang in the middle of the photo. Divide the picture mentally into thirds (both ways – ie 9 squares) and focus on an area where the squares intersect. It’s always difficult to photograph something very small next to something very large…so go down low again, and think about composition. Lisa’s tip here was to make sure that the tree trunk wasn’t in the middle of the picture. Follow the photography ‘rule of thirds’. And the third problem with photographing snowdrops is that February usually has a stiff breeze, or even a howling gale. This means blurred flowers as the wind sweeps over them just as you press the shutter. Doddington Place Gardens has a wonderful Edwardian rockery. Pockets of snowdrops are peeping out from the rocks, where they are sheltered from the wind, so this photograph was easier to take. If you’ve got a proper camera and know how to use it (not a very common combination), then you can compensate by using a very high shutter speed. But if you’re on auto or a phone-camera, there will be more blurry whiteness. Look for sheltered spots or and/or use a tripod. Floral photographer and blogger Darren Coleshill has a good tip – he takes a clip with him to help keep flowers still, even when he’s photographing them in the wild. Check out his photo theme competitions on Instagram, where I spotted his exceptionally lovely photo of snowdrop. If you want to photograph snowdrops, there are lists of open snowdrop gardens on the NGS, Country Life and the National Trust. 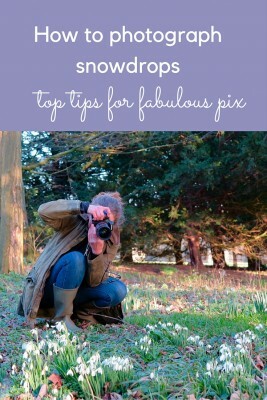 Photographing snowdrops will help you understand how to improve your photography. The difficulties apply to other flowers too – scarf designer Jacqui Eggar (St Agnes Eve scarves) says that photographing any flower with a strong block colour (daffodils, very red roses etc) will create the same problems. 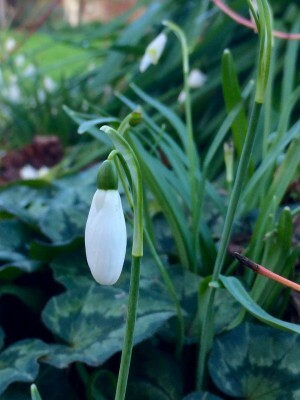 So you could either use ‘Snowdrop Days’ as a photography challenge. Or, you could go the other way and decide not to take any photographs at all and just to enjoy the experience….and do spread the snowdrop word by sharing this using the buttons below – thank you! 9 comments on "How to photograph snowdrops"
An article that hits the spot with me after so many frustrating attempts at getting the best image for my own blog. I have purchased a Nikon macro lens and it’s good for the detail but certainly not perfect. That wind you speak of is a constant nightmare when photographing. Someone recommended a clamp, but I’m not sure how that would work. Let’s just hope for some still days. I didn’t knew this kind of flowers but they are really beautiful… do you know if they grow in Italy too? 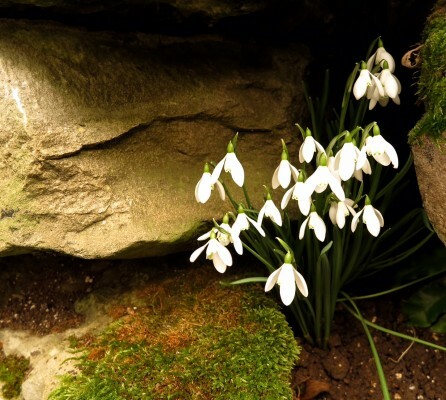 Yes, snowdrops grow throughout Europe – their proper name is Galanthus,which may be more familiar to you. They are, indeed, beautiful. Visiting the UK in February means you certainly won’t have the tourist crowds, and you should get some good hotel deals – I think only snowdrop lovers would dream of coming in our greyest, dampest, gloomiest month. 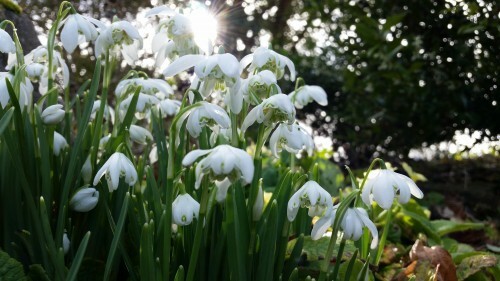 But the snowdrops really are worth it, so don’t let the miserable weather put you off! I find that staying in country cottages in January and February is not only cheap (try the Landmark Trust for really unusual buildings) but it also gives you something to look forward to after Christmas.